The On-Board Dyno™ determines Horsepower based on the continuous measurement of Acceleration, Speed and the values of vehicle Weight and Drag. For a detailed understanding of the On-Board Dyno™, please read: Theory. 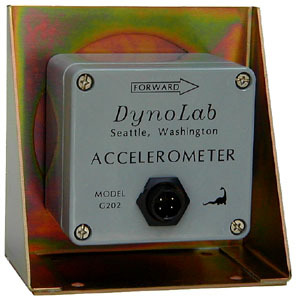 The Acceleration is determined by a precision force/balance servo Accelerometer. This type of accelerometer is commonly found in military and aerospace applications that require extreme accuracy. It is this high degree of accuracy that allows the On-Board Dyno™ to make precision measurements. The On-Board Dyno™ speed is determined by a Vehicle Speed Sensor (VSS). The type of speed sensor will depend on the speedometer system of the vehicle. In many cases, the On-Board Dyno™ will be able to use the Vehicle Speed Sensor that already exists in most late model vehicles. 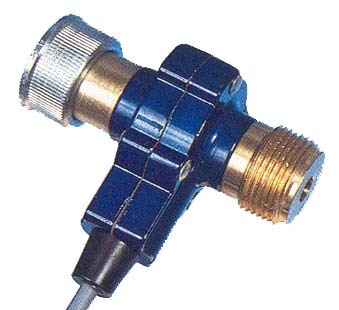 Dynolab can supply an appropriate Vehicle Speed Sensor for older vehicles and racecars. While in the Gross Horsepower mode, the total output power of the engine will be displayed. This total consists of the power required to accelerate the vehicle and to overcome vehicular drag. If the vehicle is allowed to coast in neutral, the indication will be zero. When the brakes are applied, a negative value will be indicated and it will represent the power dissipated by the brakes. If the vehicle is allowed to coast in gear, a negative value will be displayed and it will be that of the frictional Horsepower losses of the engine and drive train. The power that is being used to accelerate the vehicle will be displayed in the while in this mode. When the vehicle is accelerated, the value will be the total power minus the power required to overcome vehicular drag. If the vehicle is allowed to coast in neutral, a negative value will be indicated and it will represent the Horsepower dissipated by vehicular drag. Changes of vehicular drag are easily noted in this mode. The acceleration or deceleration of the vehicle may be determined while in this mode. This mode is useful for optimizing gear ratios, tires, tire pressure and clutches for maximum acceleration. Deceleration is indicated by a negative value of acceleration and is a direct measure of braking efficiency. Monitoring deceleration at low speed will quickly show increased drag due to brake drag, low tire pressure or worn parts. True vehicular speed will be indicated while in this mode. The speedometer function of the On-Board Dyno™ is many times more accurate than the typical automotive speedometer. This is a special mode that is used to calibrate the On-Board Dyno™ to the vehicle. In this mode, certain vehicular parameters are entered into the instrument. While some are entered by hand, most are determined automatically. These parameters include vehicle Weight, Pulses Per Mile from the Vehicle Speed Sensor, Pitch-Up Angle of vehicle, Rotational Mass of wheels, tires, and rotors, accelerometer leveling, Frictional drag, and Aerodynamic drag. Of particular interest are the values of Frictional and Aerodynamic drag. These values are determined automatically during vehicular calibration and may be recalled at any time by reentering this mode. Monitoring these drag values is very useful for keeping vehicular drag at a minimum. Any increase in Frictional drag may indicate brake drag, low tire pressure, worn bearings or drivetrain components. The Aerodynamic drag value is extremely useful for optimizing the aerodynamics of the vehicle. ReadoutThe On-Board Dyno™ measurements are continuously displayed in Real-Time by analog and digital readouts. No calculations are required and there is no need to stop the vehicle to review measurements. The analog meter provides fast response for racing conditions and is an excellent indicator of when to shift gears. The full-scale range of the analog meter scale will depend on the model of On-Board Dyno™. Full-scale ranges are available from 150 to 2000 Horsepower. The digital readout reads from 0 to 1999 on all models and provides high resolution for precision measurements. It also displays the calibration values. In addition to the continuous Real-Time readout, the peak values of Horsepower, Acceleration, and Speed are stored in memory and may be displayed at any time. The values of Aerodynamic and Frictional Drag may also displayed while in the calibration mode. The On-Board Dyno™ is controlled by the Select, + and - push buttons located on the front panel and the Gross-Net and Norm-Rev switches on the rear panel. The modes of Horsepower, Acceleration, and Speed are indicated by annunciators P (Power), A (Accel) and S (Speed). The mode is selected by pressing the Select button until the desired annunciator is illuminated. When operating in the Horsepower mode, the instrument will indicate Gross or Net Horsepower depending on the position of the Gross-Net switch. While the digital display will indicate positive or negative values, the analog meter normally reads positive values only. Switching the Norm-Rev switch to the Rev position will allow the analog meter to read negative values. While in the Horsepower or Acceleration modes, pressing the + or - buttons will cause the digital display to indicate the positive or negative peak values of the selected mode. When in the Speed mode, the peak value may be read by pressing the + button. All peak values may be cleared to zero by simultaneously pressing the + and - buttons or by turning the instrument off. The Vehicular Calibration mode is entered by simultaneously pressing the Select, + and - buttons. No annunciators will be illuminated while in this mode and the digital display will indicate the calibration values. The Select button is used to step through the calibration procedure. The + or - buttons are used to adjust the calibration values or to start/stop automatic calibration routines.